Greece’s largest island (and the Mediterranean’s fourth largest, by the way) is also one of Europe’s most popular destinations for a sun baked escape. And it’s not hard to see why. Over 1000 km of dramatic coastline, turquoise blue seas, warm water, and sandy beaches provide the perfect raw materials for a great getaway. And obviously a lot of people know a good thing when they see one. Crete, welcomes a quarter of Greece’s total influx of foreign visitors. This, of course, can be a bit of a drawback at times. But even so, the specialness of Crete can overcome the modern scourge of mass tourism. It has more, much more, to offer than just sand and sea and there is still a great deal for the discerning traveller to discover on his own terms. Choose from our unique selection of small, charming hotels in Crete and boutique hotels in Crete, including seaside Crete hotels, guesthouses bed & breakfasts, amongst others. Whatever your taste, we’ll help you find that perfect getaway in Crete. 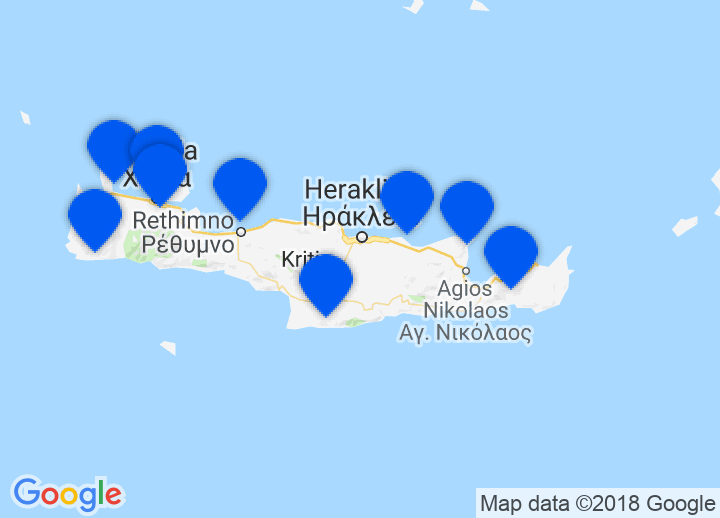 Crete’s geographical location alone, at the junction of 3 major landmasses - Europe to the north, Africa to the south and Asia to the east - makes Crete a unique proposition as it has managed to take in the best of what the many different cultures have to offer. Crete, of course, also has history. And plenty of it! According to legend, it was the birthplace of Zeus – the father of the Gods. It was one of the cradles of Ancient Greek culture so, unsurprisingly, archaeological wonders abound. Be sure not to miss the sites at Knossos and Phaistos, for example, to see some of the finest relics of what many consider to be one of the greatest, if not the greatest, civilizations of all – the Minoans. Traditional villages are also still common, as are the old men wearing their traditional attire, whilst the cities of Chania (with its fabulous Venetian port) and Iraklion are some of Greece’s most cosmopolitan urban areas. This mix of the traditional and the new adds a further ingredient to the heady cocktail that is Crete. And talking of beverages, don’t forget to try a glass of iced raki!